Check out the prizes you can win at YCS São Paulo! On the left is a GIANT CARD and oversized cards for Cerulean Sacred Phoenix of Nephthys, given to 1st, 2nd and 3rd place of ATTACK OF THE GIANT CARD respectively. On the right is Prank-Kids Dodo-Doodle-Doo. Both cards are from Hidden Summoners. In the center of the table are 3 x 3 uncut sheets for the 3 vs 3 Team Tournament. The 4 x 4 uncut sheets are for the OTS Tournament Series which will be run tomorrow. 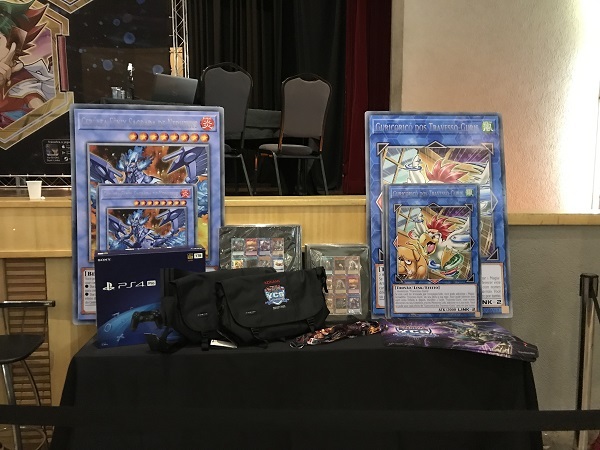 The PS4 Pro’s are given to the Top 8 of the YCS. The branded messenger bags are given to the Top 2 of the YCS. The lanyards are the Ultimate Duelist Series Qualifier lanyards given to anyone who enters a UDS Qualifier. Not pictured is the YCS Prize card Chaos Emperor, the Dragon of Armageddon, given to the Top 3 Duelists of the YCS (Ultra Rare to the winner, Super Rare to 2nd and 3rd place) with 2 additional Super Rare copies given out during the Public Event playoffs. YCS Sao Paulo: Standings after Round 6 YCS Pasadena First-Timers!